It’s clear to see how the current account deficit of the US has basically financed itself up to this point. What has happened is the dollar surplus countries have been buying all the excess dollars flooding into their countries as a hedge against their own currencies appreciating. But, they want to earn interest on their money, so they put their dollars back into investments that are denominated by the US dollar. This prompted the esteemed Robert McTeer to say, “…we get sort of a free ride. Sort of like we’re in a poker game and we never have to cash in our chips.” This ride can’t last, though. The US can’t keep plunging further and further into debt. At some point, the US is going to have to settle up. The new Sovereign Wealth Funds in countries with dollar surpluses will also have to be figured in to expectations on what creditors intend to do to stave off losses on dollar holdings. 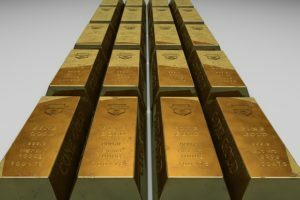 Gold experts believe that Dr. Ben Bernanke will take a unique course of action when the time comes for the US to settle up. He is the US Federal Reserve Board Chairman. They think he will print money recklessly and pay down the debt with a currency that is deeply devalued. They have thought this would happen since 2002 when he said something to that effect in a speech. It was shortly after he became a US Federal Reserve Governor. His speech was entitled “Deflation: Making sure it won’t happen here”. It was a 5,000-word speech, but there was one part that stood out in particular. A lot of experts took note of it at that time. He said, “…but the U.S. government has a technology called a printing press (or, today, its electronic equivalent), that allows it to produce as many U.S. dollars as it wishes at essentially no cost.” That part of the speech really stood out to analysts. He basically suggested that he would stop deflation by printing as much money as he needed to. Most economists would say it’s the right course of action. Not many people think his course of action is irresponsible, reckless, or irresponsible. Most people think it’s the right thing to do. Still, bad developments in the wake of the US sub prime mortgage and related shadow banking debacle lead people to believe that Bernanke will be forced to print money to stave off deflation. It’s not a bad idea to own gold to hedge against risk and mitigate any damage a financial crisis might cause. Insulating your assets is always a good idea. Franklin D. Roosevelt devalued the dollar to gold by 47% in 1934 when the US Treasury couldn’t make good on its commitments. Gold was the universal measure of value way back then. Interestingly enough, when President Richard Nixon got into some hot water in 1971 and had to back out of all his commitments to gold the market value of gold rose from $35 for an ounce to over $600 within the span of a decade. Nixon said that there would be a surcharge of 15% on all imports so that he could force negotiated dollar devaluations of over 20% against international currencies. James Baker was Nixon’s Treasury Secretary in 1985, and he negotiated something called the Plaza Accord with Japan, Canada, Britain, France, and Germany that allowed for the floating dollar to go down 30% over the following two years. The current rebalancing could end up having a “soft landing” but, if we look at history, the dollar and many other currencies are on track to lose purchasing power. In order to really understand 9/11 and what happened afterward, you have to look further than Osama bin Laden and Al Qaeda. The United States had a lot of enemies around the world before 9/11, and some of those were the “Afghan Arabs” in Afghanistan. These were the men who joined the fight against Soviet Russia in the 80s. It’s interesting that the CIA funded them in large part, because they became some of America’s most pernicious enemies. They were completely ignored after the Soviets left the region. I want to talk about them because they were some of the people who were dangerous before that infamous day of 9/11 and still are. How as the Afghan jihad funded, though? It’s an interesting question, and it still comes up to this day when people ask how the 9/11 terrorists were funded. The two aren’t one and the same, but they are interrelated – at least somewhat. Let’s look at it for a second. The funding for the regional jihad against the Soviets came from a number of sources – you’ve got Saudi Arabia, Pakistan, and of course the U.S. via the CIA. Saudi Arabia had their own reasons for supporting the jihadists. They had religious reasons, and they also wanted to get these radicals out of their own backyard. Pakistan gave them money so they could claim to be the center of the Islamic world, and U.S. funded them so that they could send Islamic fighters to do their bidding and not send their own soldiers out onto the battlefield. Why lose American soldiers when you could have Islamic fundamentalists do your job for you? Robert Gates, a former CIA director and current U.S. Defense Secretary, wrote in his book From the Shadows that the US government learned in 1985-1986 that there was “a significant increase in the number of Arab nationals from other countries who had travelled to Afghanistan to fight in the Holy War against the Soviets.” He also says that they “examined ways to increase their participation, perhaps in the form of some sort of international brigade but nothing came of it.” It’s not a shock that not much came of the idea, but this comment Mr. Gates made is almost unbelievable: “Years later, these fundamentalist fighters trained by the Mujahideen in Afghanistan would begin to show up around the world, from the Middle East to New York City, still fighting their Holy War – only include the United States among their enemies. Our mission was to push the Soviets out of Afghanistan. We expected post-Soviet Afghanistan to be ugly, but never considered that it would become a haven for terrorists worldwide.” Was Mr. Gates really so naïve as to think that this motley band of religious fundamentalists would commit themselves to upholding liberal values and the tenets of Western democracy? Of course not. One of the central figures among the Afghan Arabs was university professor in Pakistan. His name was Abdallah Azzam. Mr. Gates and everyone else looking at the issue must have known what he was saying and publishing. He was funded by Saudi Arabia directly and the CIA indirectly, and he set up something called a “Bureau of Services Maktab al-Khidamat”, for the Mujahideen in 1984. He didn’t hide his extremist views. He was one of the founding fathers of global jihad, and his goal was to spread militant Islam around the world. He published Al Jihad, which was distributed throughout the world. He was very extremist and staunch in his views. He declared that defending Muslims against infidels was every religious man’s moral duty and that they were committing a capital sin if they didn’t do it. He said that it was necessary every man fight in the Afghan Holy War. After victory was declared in Afghanistan, he continued on with his campaign. He wrote, “the jihad will remain an individual obligation until all other lands which formerly were Muslim come back to us and Islam reigns within them once again. Before us lie Palestine, Bukhara, Lebanon, Chad, Eritrea, Somalia, the Philippines, Burma, South Yemen, Tashkent, Andalusia … Our presence in Afghanistan today does not mean that we have forgotten Palestine. Palestine is our beating heart. It comes even before Afghanistan in our minds, our feelings and our faith.” What he really wanted to do was establish an Islamic Caliphate. It was 1924 when the Ottoman Sultan was removed from power as Caliph of the Islamic world by a secularist named Mustapha Kemal. That was the last of any kind of centralized authority in Islam. Azzam said that Muslims shouldn’t wait for the caliphate to be re-established before they took up the cause of jihad. He said that jihad was the best and “safest path” to help establish universal leadership and a Caliphate. Osama bin Laden was a known associate of Azzam. In fact, he first met him when he was an instructor at a Saudi Arabian university. Even though they disagreed from time to time, they got along for the most part and worked together hand-in-hand in Afghanistan. After Azzam was assinated in 1987, bin Laden took over Azzam’s organization, which was the predecessor of Al Qaeda. Azzam had issued a fatwa before he died where he said the following: “The ruling to kill the Americans and their allies – civilians and military – is an individual duty for every Muslim who can do it in any country in which it is possible to.” Religious groups associated with bin Laden endorsed it in 1998. Bin Laden was a big, looming figure at the time, and he was trying to get access to weapons of mass destruction. He said the following: “It would be a sin for Muslims not to try to possess the weapons that would prevent infidels from inflicting harm on Muslims. Hostility towards America is a religious duty and we hope to be rewarded for it by God.” Egyptian intelligence warned the U.S. in the early 1990s that bin Laden was training a thousand radicals to bring about a revolution in the Islamic world. If we connect the dotes between Azzam, bin Laden, Al Qaeda, and 9/11, it gives us a picture that, if written in a fiction novel, would be tossed out as too strange to be credible. That story would include the actions of a cocaine-using, woman-chasing US Congressman and committee chairman named Charlie Wilson, who was a big supporter of the Afghan Mujahideen. A movie was made about his adventures in Afghanistan called Charlie Wilson’s War, and it was released in 2008 and based on the book Charlie Wilson’s War. Another interesting element of this story is that Under Secretary of Defense in the administration of Ronald Reagan lobbied for support for the Afghan rebels while Osama bin Laden and Ayman al-Zawahiri were in training camps in Afghanistan and Pakistan being rebranded as freedom fighters fighting against the Soviets. Gilles Kepel, in a recent interview, said that Americans don’t want to remember that Reagan’s administration was what made jihad possible, back then and right now, and Islamic radicals don’t like to be reminded that without American arms the Soviets never would have been defeated. Understanding the above comments is very important for investors. Even though George W. Bush made a lot of mistakes, we have to keep in mind that the US has been at war since 9/11, and it was not a war that we began. In thinking about things, we have to draw a line between the pre-9/11 world when the U.S. wasn’t at war and the post-9/11 world when the U.S. is at war, and the currencies of countries at war is usually a little bit weaker.